Currency and currency rates are a big set of issues in this volatile market. So, it’s best to be able to keep on top of things minute by minute! The Mexican currency- banknotes generally are in the following deniminations: 20, 50, 100, 200, 500, and 1000 MXN. (see the photos). The coins are in the follwwing denominations: .10 centavo, .50 centavo, 1 peso, 2, 5, 10, and 20 peso, although its not quite often that you see a 20 peso coin, but they’re out there! The economy in Mexico, compared to the USA for instance, is good for the Gringos but not so much for Mexico. Essentially, we can buy more with our US dollars for a lot less so the Mexican economy suffers. It’s normal for a single person to live quite nicely (although not extravagant) on around 10,000 MXN per month. At current exchange rates, that’s about 500 USD. You can usually find a nice 1br apartment or effeciency for around 4500 – 6000 MXN, you pay the electric once every 2 months (which can vary greatly during peak seasons – ie winter) and depending on how much you use, your bill can be as low as 950 MXN per month! (Around 50 USD). We’re in the middle of putting together a shopping guide which gives the average price of many common items (and some not so common) so that you can sort of calculate what your general expenses may be. Also, we’re getting ready to show some really nice apartments and hotels that are very inexpensive (muy barato) yet clean, nice, safe, and quiet! 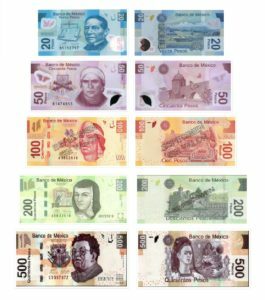 Below are a couple of photos of the Mexican currency. Get to know what the bills and coins look like so you won’t be shocked when you exchange your USD for some good old MXN! Speaking of which, there are many exchange houses but the easiest, safest, and fastest way of getting MXN is by using the ATM machines. Almost all of the banks here will honor US debit and bankcards with Visa or Mastercard stamped on the front, with or without the new imbedded chip. A bit of advice from experience: be sure to sign your plastic and that the signatures are spot-on for your passport! Otherwise, you might find yourself standing in a long line of people, you at the front, and not understanding that the cashier at the store you’re shopping in is telling you that you need to find an alternative method of payment, namely CASH! OK, so back to exchanging the currency. Don’t bother going inside the banks to talk to the tellers because a) they generally don’t speak English, and b) they won’t exchange your currency in the first place. The hotel that you will be staying at can direct you to an exchange shop with fair rates. You can use the currency calculator on this page to give you a close estimate of what you’ll get. Drop us a note if you have questions on the subject of currency (or any subject for that matter!) We’ll respond as quickly as we can!